One baker's attempt to take the mystery out of sourdough bread baking. If you do not see the “Reply” button, you will need to log in or register an account. Please click the blue “Log In” button in the upper right of the page. Brilliant! Particularly the tips re the kevlar gloves and the wet dough. It’s often the small things that stymie us. I’m sure this will be invaluable for those new to sourdough baking and ‘old triers’ like me. Thanks for posting. Excellent demystification! One thing you did not mention about the mythology of “special culture” is that so many microbes come in with the flour you feed it, every time you feed it, that your “great grandmother’s” starter that has been handed down for 100 years is quite different from what it was a few months ago, let alone when your great grandmother was using it. Thank you for putting this together! I think that the part of the overall flavor profile of a given loaf of bread that comes from the sourdough fermentation process has far more to do with how the microbes from the starter are affected by the particular flour you are using for your bread, the temperature, the length of the fermentation period, and the ambient mix of yeasts and bacteria that is present in the flour you use, the water you use, and even in the air in your kitchen. …but you are right that most of that thought is fairly implicit in what I wrote. I should expand that section and be more explicit about how much constant microbial turnover there is. Thank you for your insight. journey for sure, gathering information bit by bit along the way. It sure is helpful to have folks like you share what you know. I love your 100% WW “protocol”. As far as getting the loaf into the oven, I use a lodge dutch oven turned up side down so the loaf is sitting on the lid. I sprinkle flour on the loaf in the banetton, invert a salad sized plate on top and gently flip over, then can just slide the loaf onto the cooker lid. Two comments - I appreciate this article. It aligns well with my philosophy that there are many ways to do sourdough. All of them are wrong except for the method that works well in your own kitchen. And, one correction. The microbes in sourdough are not aerobic organisms. They are “facultative anaerobes”, meaning that their metabolic process does not require oxygen but, unlike obligate anaerobes, they function very well in the presence of oxygen. The starter does not need to breathe, but it does need to exhale - thus it is not a good idea to keep it in an air tight container. Thanks for this correction. I’ll fix the post. I was being a bit nit picky. Really appreciate what you did thinking through all the issues and writing it up. proofing baskets - clay or wicker? I am an absolute sourdough bread baking beginner. I got a starter from my friend but was given not much detail how to maintain it which intimidates me because I’m used to following exact recipes. This article was eye-opening in so many ways and gets me excited to actually bake my first bread. Thanks! One question though. I read that there’s a test how to make sure a starter is “ready” for baking: putting a small amount in water and see if it floats. If it falls down to the bottom of the glass, it isn’t ready and requires more time of feeding and establishing a good culture. Any thoughts you could share around this? Well written concise and informative article ! “We” tend to want a “pill” to fix everything whether it be sourdough baking or other things. The older I get, the more I enjoy slowing down, observing, trying what works for me with at least a vague understanding of why. Thanks for sharing your thoughts and what you’ve learned and observed - I believe there is a lot of work in getting this all down “on paper”! I posted a link to your article on facebook. It’s getting lots of likes. I love the image of “listening to the dough” vs waiting any amount of time. Hi. Great article. So helpful to this still novice baker. My main problem has still been the dough sticking to my proofing basket making it a frustrating experience transferring dough to baking vessel! Help! I have watched all the videos but somehow I just can’t get the release, unless I use parchment paper. Any other ideas? I use a cotton liner in my proofing basket and I sprinkle some rice flour on the sides and bottom of it. And then I also often sprinkle a little white bread flour on just the bottom of the liner / basket as well because I like how that looks on the finished bread better than how the rice flour (which tends to turn a little yellow) looks. The amount of rice flour I use depends on how wet my dough is. For dry dough I will use a tiny amount or even skip it. For very wet dough, I use a lot. 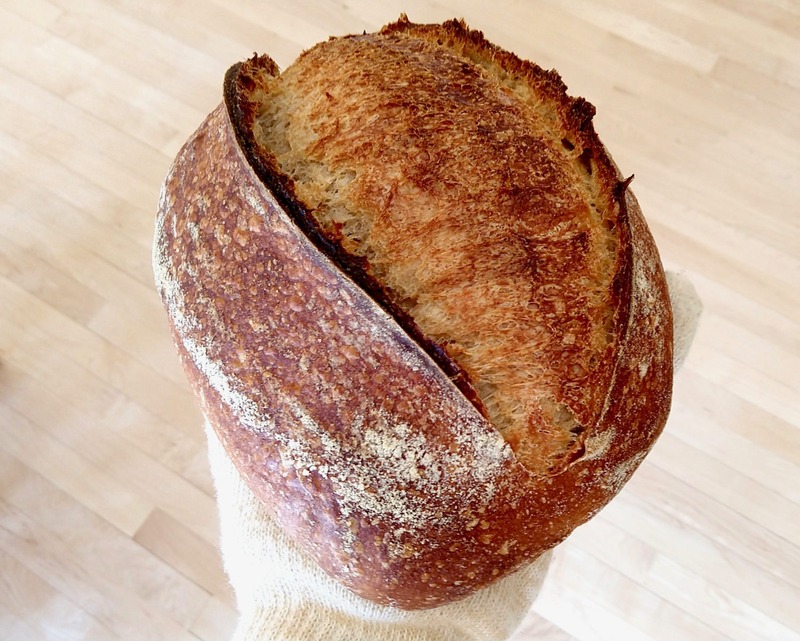 Best, most informative and user friendly article on sourdough I’ve ever read. Science written in a manner that can actually be helpful to anybody! Thank you! Nice article. I had trouble making sourdough trying to follow what others were telling me. My process is different than yours and probably different than most I’ve read about. Like you say and this is also something I learned being a home brewer many different ways to get the same result. I pick up tips and tricks and just incorporate them in my brewing and baking process. I have 2 starters a white and a rye and all my bread gets beer. I’m going to try that wet hands thing because I’m usually covered in flour. Either that or wear whites. I teach sourdough baking to our lifelong learning group and this is exactly what I try to convey to the class. Students come in expecting the “magic bullet” of sourdough bread baking and I know only 1 or 2 out of a dozen will get it. They want all the answers without the trial and error. I do recommend your site because over the years I found you make the most sense for home bakers. The wet hands is my take away in this article.